You can add all the ingredients according to your preferences, but this is the way I arranged in the glass. 1. Crumble the cake, but I used the biscuit cutter to cut the cake. 2. Fill the down layer with the cake, spoon the cherry syrup over the cake. 3. Whip the cream adding sugar and essence. Divide into two portions. 4. Melt the Chocolate chips in the Microwave until it melts(Keep an eye, it can burn easily). 5. 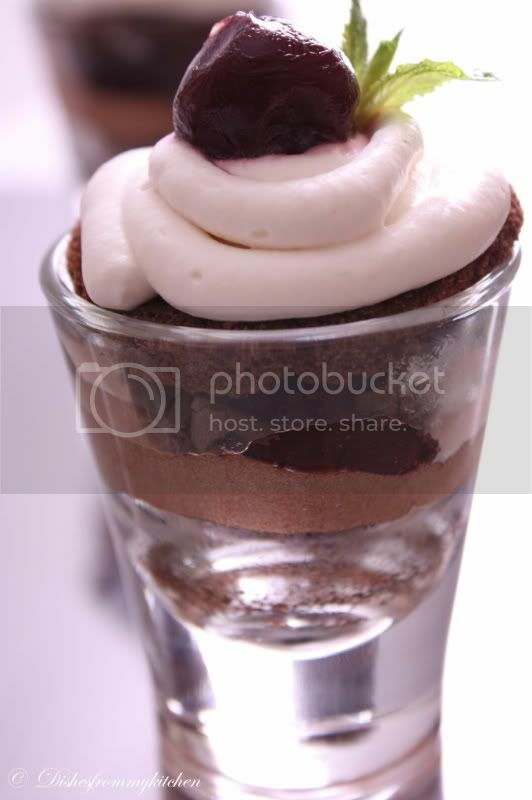 Cool the melted chocolate, once it is cooled add the 1/2 whipped cream and whisk well until they are blended well. 6. OK now fill the next layer with the chocolate whipped cream, followed by few cherries and chocolate shavings. 7. Next fill it again with the chocolate sponge, now spoon(moistening) little cherry syrup over the cake. 8. Finish them by piping Whipped cream. Garnish with cherry, chocolate shavings or mint as you wish. Keep it refrigerated for few hours , minimum 4 to 5 hrs. Serve chilled and enjoy every single spoon. 1.Adjust the quantities of each ingredients according to the size of the glass or dish whichever you are using. 2. 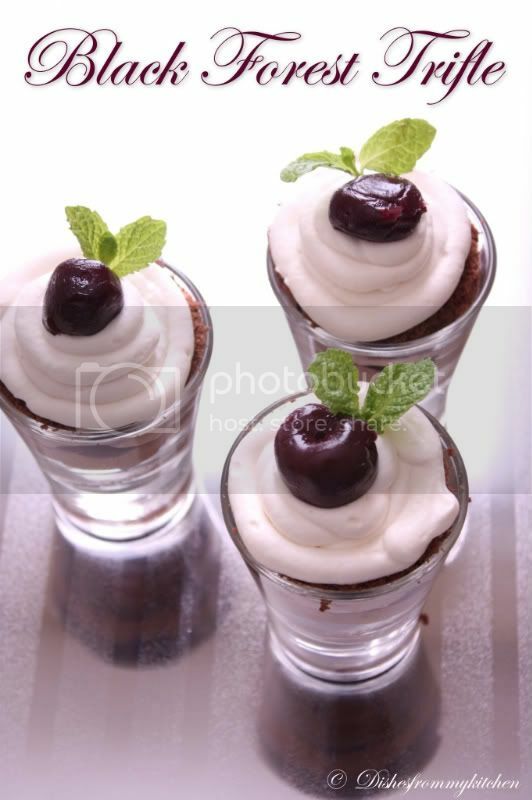 You can also use the Krisch Liqueur for soaking the sponge instead of drained cherry syrup. 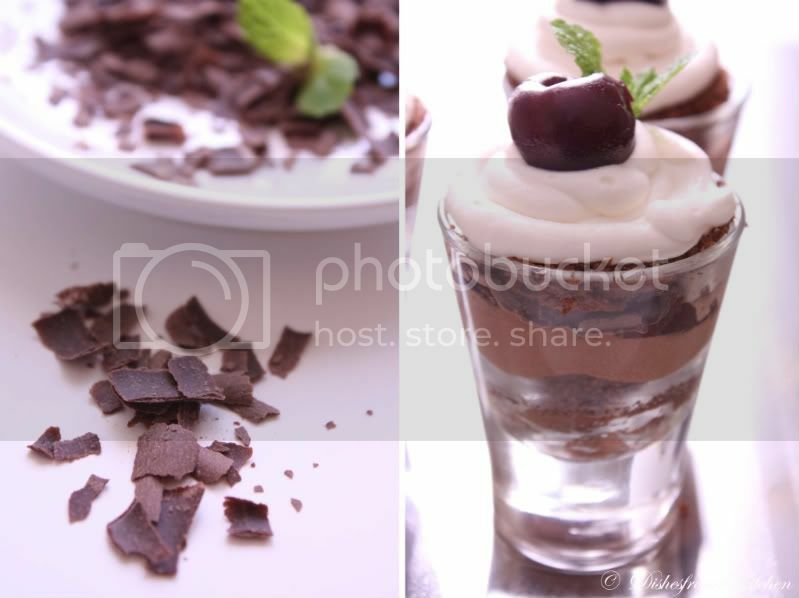 Wow looks super yummy.Beautiful clicks. Pavithra, this looks insanely delicious!! Wow!! What mesmerizing pictures, Pavithra. Love the cute glassware out there. tempting and delicious trifle. Lovely recipe with a wonderful presentation .... Love it !!! woooooooooooooooooooooooooooooow.... I can not express beyond this!!! looks lovely :)...Can I have one? 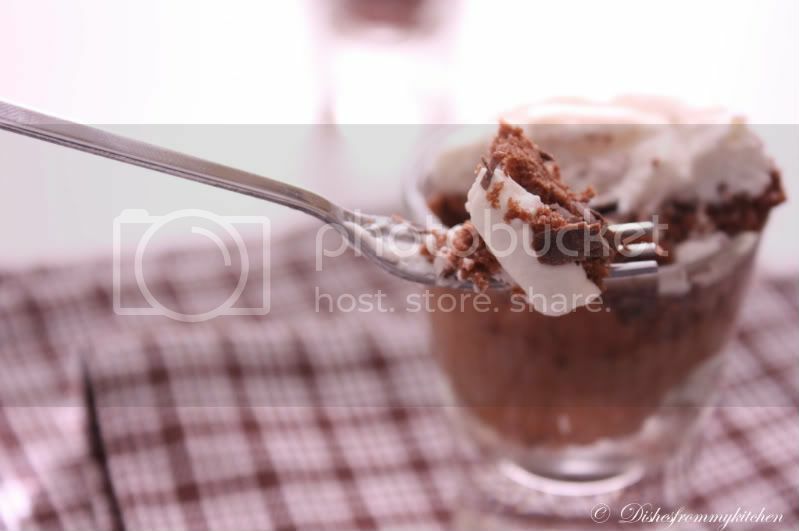 lovely dessert Pavithra..love ur clicks! this looks so yum! Amazing click and so simple too! Looks so tempting..pictures are really really good.. These Pictures are a feast to the eyes..
cake looks so yummy and pics are so aswsome..
OMg, just drooling here..pictures tempts me a lot..delectable trifle.. 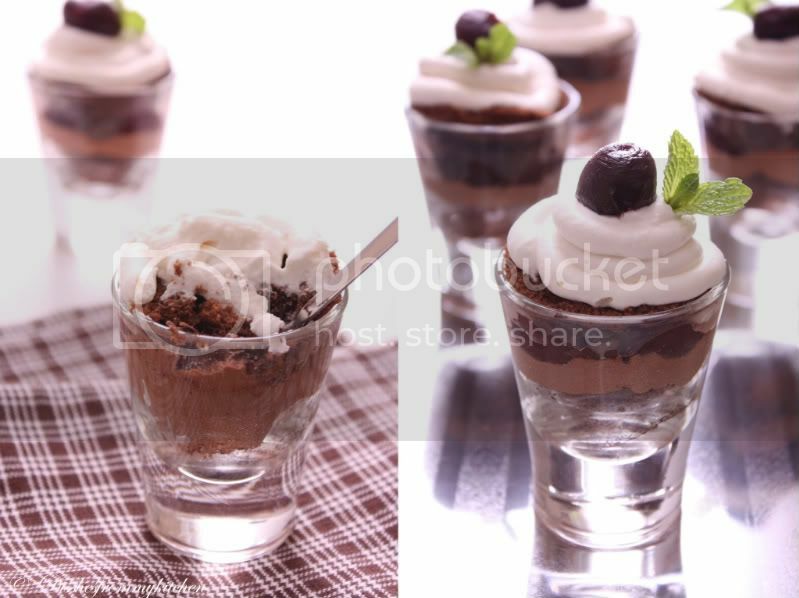 Trifle looks very tempting, nice clicks ! 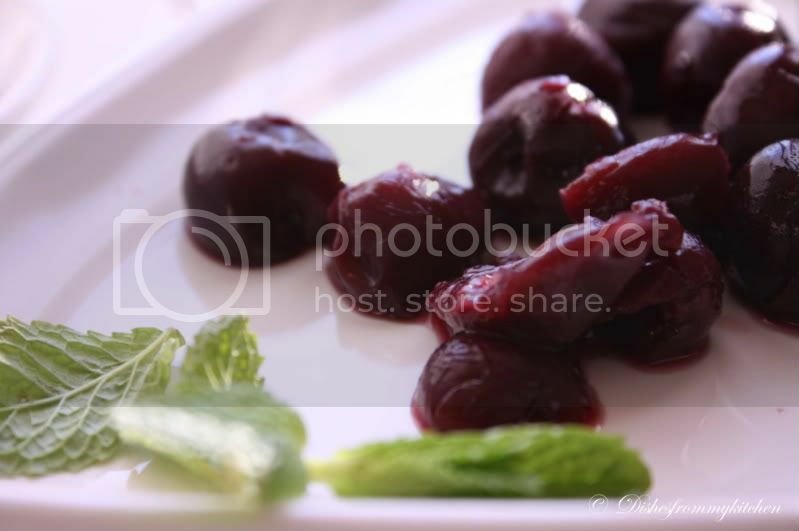 Oh man...simply amazing...those snaps are so professional...thanks for sharing..
well check out the Healing Foods - Event Brocolli at my blog...and same some cool entries. A very nice recipe! The snaps look so beautiful and mouth watering! wow...mouth watering..im just drooling here..lovely presentation. 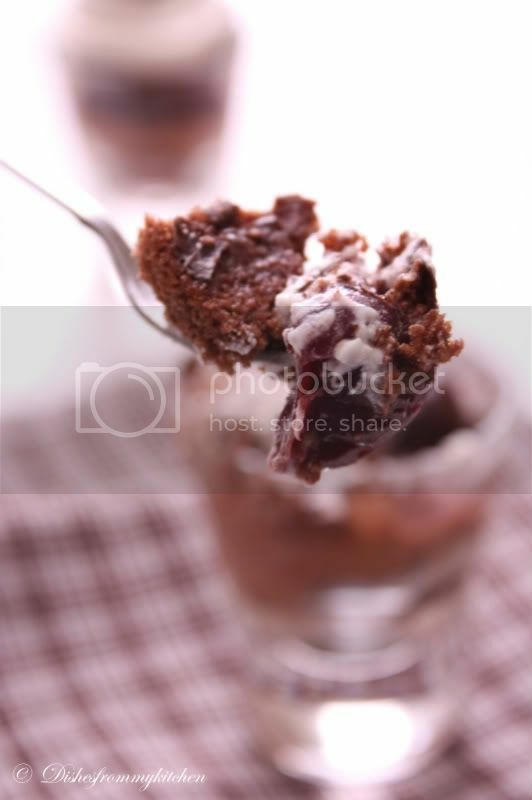 Black forest triffle looks delicious. Nice one. Wow!!! Triffles luks delicious...Very tempting pics. Can I get one order of this parceled to my address please. Simply drool-worthy !!! Hey Pavi!! Love the trifle - sorry I'm so late. I'm having major computer problems and not been browsing much! Love the trifle. Glad the little guy got his own black forest party! Oh That's a beautiful one...tongue tickling...Mind if i grab it!! Just one simple word...GORGEOUS! Add 1 more word...EXCELLENT! Yummy Pavithra! I wonder how you maintain ur weight with all these wonderful cooking you do! :) Lovely clicks as usual! 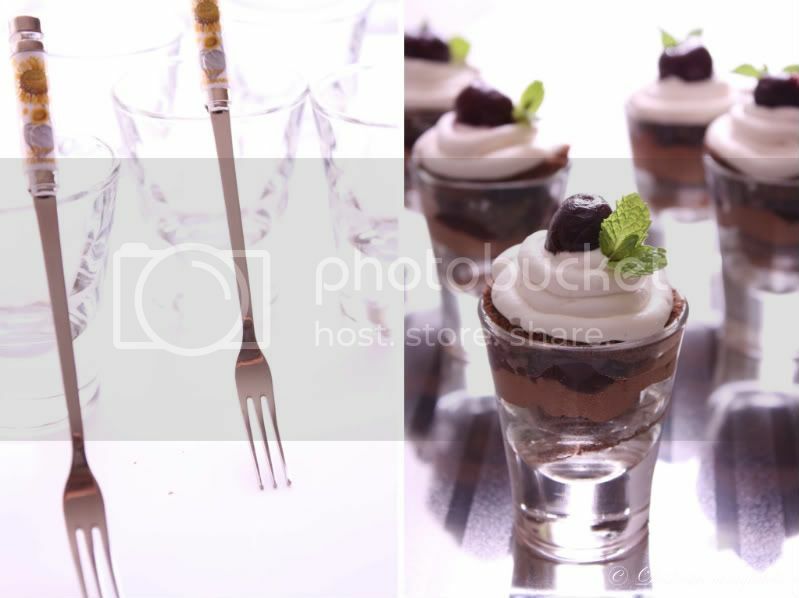 I love this idea of serving Black Forest Trifle in shot glasses. Fabulous presentation! Yum yum!!! Super simple and super yummy dessert! What a Treat to eyes Pavithra!! Like the arrangement with forks standing Tall. Heaven in a glass simply amazing. Agree Pavitra :) They look adorable and heavenly! 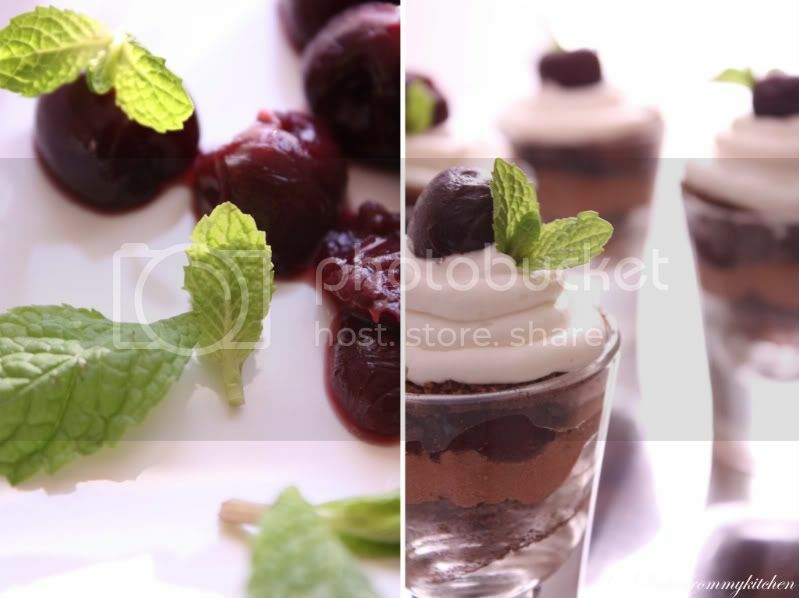 u should get an award for this beautiful presentation n click...droooooooooooling me all way....excellent job..
Cherries and chocolate is classic combination! Your photos are excellent too. How do you blur the background?? Creamy, chocolatey, and luscious! Beautiful presentation too. 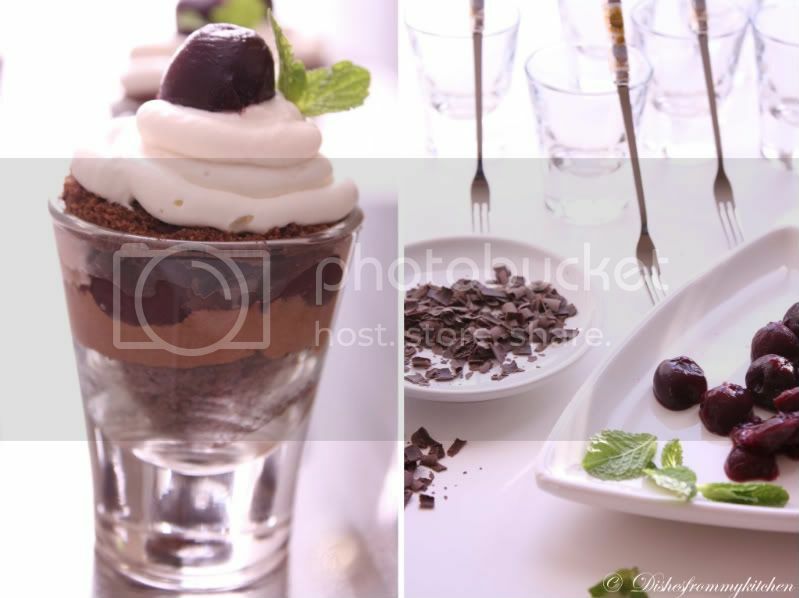 This is a brilliant idea; I love black forest cake, but the thought of ingesting a large slice of that rich cake is not appealing; however, I would fall for a small verrine like this without a second thought! I am doing this soon! They look so elegant and delicious... nicely done. How are you? Here after a long time.I have missed so many of your postings. I am not into baking but I like to read the recipes and your photography, specially the way you make the subject in focus and background blurred. I am going to try the herbal rice soon. Oh WOW!! Awesome trifle! Hey, Y dont u link it to the 'Trifle event' on my blog! Do check it out!Lovely blog u have maintained Pavithra! Following you! do you seriously make all this?